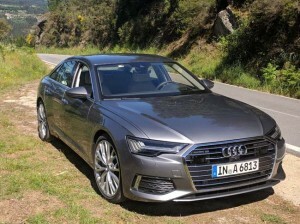 The 2019 Audi A6 sedan marks the 5th generation of the E segment or Executive sedan introduced by the German automaker. All-new for the 2019 model year, the Audi A6 follows a familiar pattern with new Audi models evolving the design, build in more safety and convenience features and load the vehicle with more technology to improve performance and efficiency. The exterior appearance looks familiar with the core design language transferred from other Audi models like the new A5 and A7 models. The A6 was the last of the Audi sedan or coupe models to be updated, as such it benefits from the latest refinements developed since the last model was introduced. The sheet metal benefits from sharper angles and subtle performance cues such as the creased elements over the wheels, referred to as Quattro blisters by Audi designers. The stylish lightweight steel and aluminum body, rides on a 12mm longer wheelbase. Up front a new lighting arrangement introduces yet another unique Audi headlight design and also pairs it with a redesigned taillight layout. The segmented lights make the 2019 Audi A6 instantly identifiable, day or night. 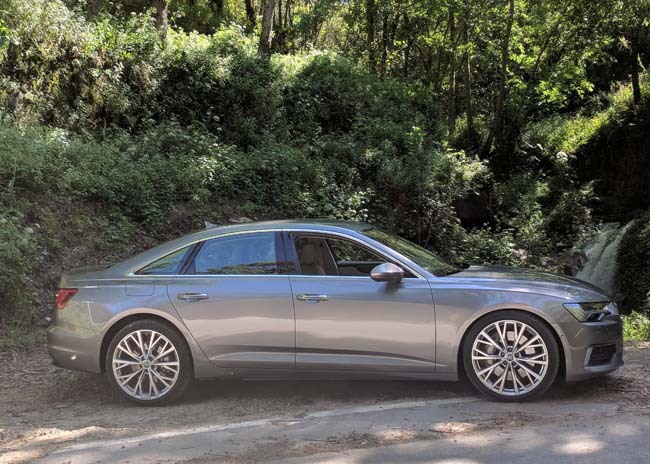 The new A6 shares its underpinnings with the previously tested 2019 Audi A7 as both are built on the MLBevo platform. The chassis is a scaleable design and is also used on the Audi Q7 SUV. Overall the exterior dimensions are essentially the same as the previous model, but interior room has increased nominally. Rear seat leg and headroom benefit most for the redesign. Making the most of available space also included redesigning the rear trunk hinges to permit a larger opening to better utilize the 530 litres of available trunk space. The lid also comes with a power assist to open and close with minimal effort. Drivers will appreciate the migration of technology from Audi’s flagship A8 sedan. The driver interface systems have been adopted from the class leading A8 model and include the benchmark Audi MMI system that controls interior climate, audio, technology connectivity and vehicle dynamics. The system is laid out over two large capacitive LCD screens, 10.1 inch and 8.6 inch units, that sit low on the centre dashboard area. Visually it draws comparisons to the glass cockpit controls found on aircraft. The system allows drivers to store favourite functions on what can best be described as a desktop or home screen. In fact thats probably the best analogy, the system operates more like a smart phone than other cumbersome digital or electronic interface systems found in other cars. Another plus is the physical feedback when inputting on the system, the mild reaction to physical touch assures drivers or passengers that the input has been accepted. The larger screen operates top level functions such as vehicle setup and navigation inputs. The five most utilized functions can be stored as home screen shortcuts on the top screen. The lower 8.6-inch screen allows for input to the climate settings, detailed menu adjustments and allows for storing shortcuts for other features. Incredibly, with a multitude of driver assistance systems available, the new Audi A6 has up to 5 available exterior visual cameras, 5 radar sensors, 12 ultrasonic sensors, a laser scanner as well as an infrared camera for night vision detection. All these input devices interact with features that include (amongst others) park, driver, lane departure and traffic assist, Audi pre-sense collision avoidance system, as well as Adaptive cruise control. Another innovation is the integration of satellite navigation mapping to help the system deal with curves and elevation changes all in the name of fuel efficiency. 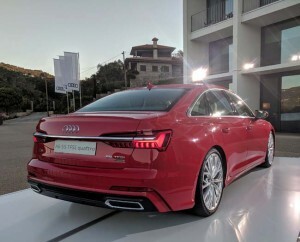 In Canada, the 2019 Audi A6 will be available with a 335HP 3.0L turbocharged V6 engine that produces 369 lb.-ft. of torque. Audi’s Quattro Ultra Technology system will be standard and power will be communicated through a 7 speed S-Tronic dual clutch transmission. The Quattro Ultra Technology system is a computer controlled and reactive system. To preserve fuel the system operates in front wheel drive mode until the system senses the need for rear wheel participation. We have tested the system in earlier models and its integration is seamless. 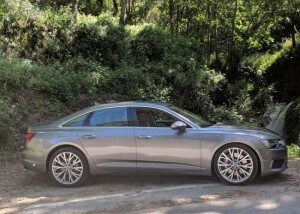 Standard on all 2019 A6 V6 models is the same 48 volt mild hybrid system (MHEV) used on the A8 and A7. The system uses an integrated starter and alternator to reap and harvest power depending on need and opportunity and can recover power under braking and deceleration. It can also provide a boost under acceleration. In fact, at speeds between 45-60 km/hr, the vehicle will return power to the drive train for up to 55 seconds which means it can save up to 0.7L/100kms. A 2.0L turbocharged four-cylinder will be offered in Canada on later A6 models and will offer a 12V MHEV system. On our test drive through the Douro Valley in Portugal, I was paired with another journalist who is a bonafide racing driver, yes he actually has a racing licence. I am a fairly conservative driver and fully appreciated the refinement that the drivetrain in the new vehicle offered. 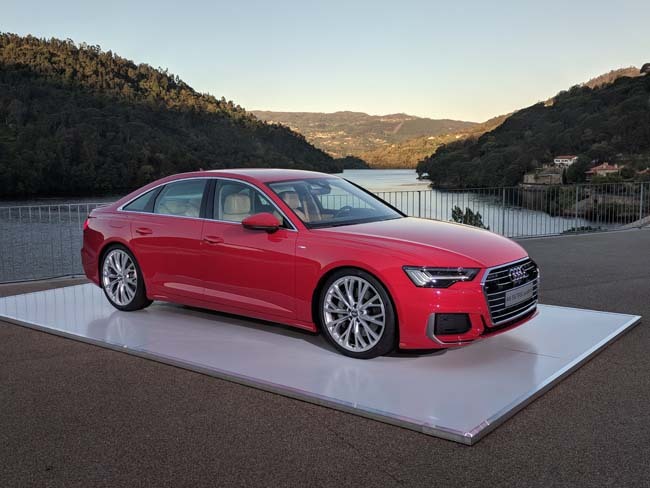 Audi call the chassis of the new A6 an Electronic chassis, this refers to the various components that are electronically controlled such as the steering response, suspension controls, all wheel drive differential control as well as body roll control. These various elements are adaptable through the dash-mounted Drive Select control. I tended to leave the system in automatic and enjoyed the pleasant drive through the twisty hillside roads. When needing to pass slow moving trucks or vehicles, the system ratcheted up the response to perform the maneuver before returning the regularly scheduled comfort settings. My co-driver on the other hand needed to delve deep into the dynamic settings of the Drive Select system. His surging technique for power application and braking was physically trying however the large comfortable sedan responded without hesitation. The car lunged into corners and fired off burst of acceleration when needed. The available all wheel steering helped tuck the A6 into tight corners with impressive stability. The optional air suspension with active damper controls lowered the ride height by 30mm, keeping the vehicle flat and engaged throughout the seemingly endless assault on my senses. After staggering out of the vehicle some hours later, I had gained new found respect for the vehicle’s capabilities if not for my partners driving technique. 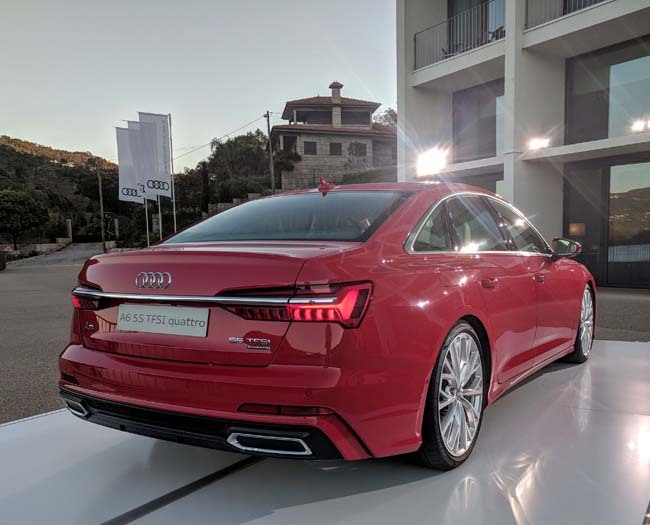 The 2019 Audi A6 remains the ultimate segment buster for Audi. It fills all spots required of a vehicle in the category. First it provides the creature comforts and refinement required to be the choice of the career corporate types. It also serves as the upscale family vehicle in various trims in Europe. It will also feed the performance appetite, most notably when S and possibly RS models arrive at a later date. For such a multi-purpose tool, the 2019 Audi A6 manages to excel in most if not all areas, proving you can be a jack or all trades and a master of them also. The 2019 Audi A6 will arrive in Canadian showrooms sometime in the 4th quarter of 2018. Pricing and package listings have not been confirmed to date.